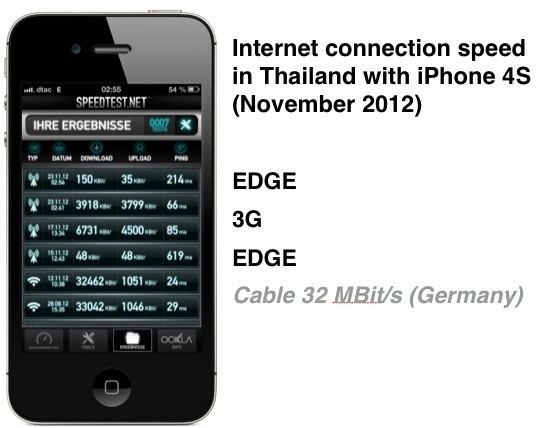 3G is now widely available in Thailand. Here are some notes about using an iPhone in a small village about 7 kms away from Khon Kaen in the northeast of the country. With this configuration and normal usage of the 3G-Connection (estimated 1h/day) and no calls the remaining battery power was at 40% after 10 hours. It’s hard to say wether the device has higher battery drain in Thailand than in countries with lower average temperature because there are so many factors affecting it. As I did not drop my habits using the device in Thailand it seems to me that there is no significant difference. To be on the safe side I use the ‘Mophie Juice Pack Powerstation mini’ (Mophie 2.500 mAh / iPhone 4S 1450 mAh). Recharging is fast (1%/min) and may be applied 2 times a day if the device is charged to 80%. Use Wireless-Fingertip-Connection to connect to your finger, go to SETTINGS and adjust the temperature or use the ‘Auto-Temperature’ feature. If the limit is reached you will get an SMS. 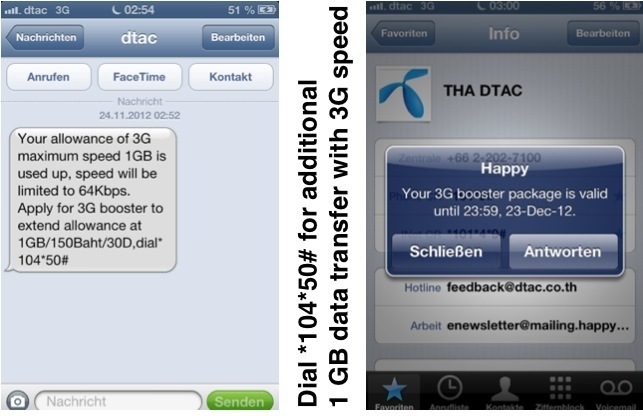 It contains the dial-up *104*50# with which you can activate the ‘3G BOOSTER’ for 150 Baht (4.88 $/3.76 €) with 1 additional GB for 1 month. Nearly all shopping malls (Tesco Lotus, Big C, MBK, …) offer Prepaid SIM-Cards. An alternative is to buy it directly at the Suvarnabhumi-Airport on arrival. There is a DTAC-Office at Arrival-Floor. Register on the DTAC-Website for controlling your balance from outside the country. The validity of prepaid SIM-Cards is limited. Every time you refill your account the validity is extended (150 Baht (4,88 $/3.79€) – 1 month). If you often visit the country and want to keep your number you may extend the validity up to 360 days for just 2 Baht/30 days. You can do this by E-Mail short before your card expires. As an alternative dial *113*days# with days = 30, 60, …, 360. Staying in the country you can refill your account at all shopping malls, 7 Eleven and in many small kiosks. After successful refilling you will get an SMS which contains the remaining call-credit and the expiration date. Have a nice trip and enjoy the delicious food and fruit.